The Power Smart 24-inch 208cc LCT Gas Powered 2-Stage Snow Thrower with Electric Start is manufactured by Amerisun Inc. and sold on Amazon. 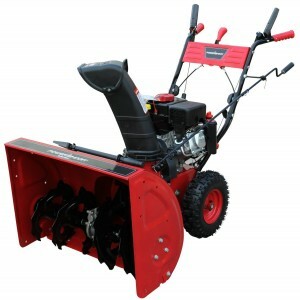 It is a pretty standard snow blower suitable for most residential applications. At 24 inches wide it will clear your driveway and also be easily stored in your garage or work shed. If you have high snow drifts and lots of snow with a large driveway you may want to opt for a larger machine that has more power and a wider intake to make faster work clearing snow. However this machine will meet most residential demands. It would not be recommended for any commercial applications due to its small size. Description: The Power Smart 24-inch 208cc LCT Gas Powered 2-Stage Snow Thrower with Electric Start comes with 4 forward and two reverse speeds, 24 inch clearing width and a manual controlled power chute. This machine also comes with steering control and electric start to help consumers manage this snow blower while clearing snow. This snow blower, had 202 reviews at the time if this review with a 73% positive rating of 4 or better. The majority of customers were very happy with the product. However 27% of customers are unhappy with the product mainly due to poor customer support, poor packaging and missing parts in the box. Some went as far as to recommend that customers should not purchase this product.